I love my Bind-it-All for creating quick and easy books. 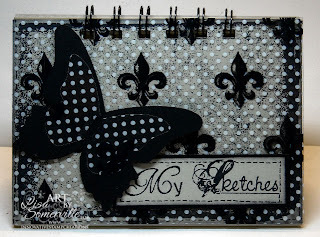 Innovative Stamp Creations has just released another Mini Book Plate - A Journal. 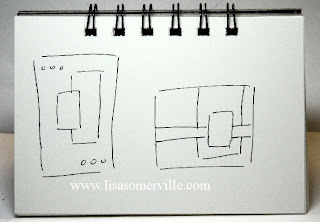 I used my images to create a place to jot down sketches for later use in my creations. I used the larger dotted stamp from the plate at the background on my Sahara Sand card stock, sponged the edges then adhered to my Book Board. I layered my Teresa Collins Transparency over my stamped image, then punched with my Bind-it-All. The sentiment "My Sketches" is also from this same plate. I used the Drywall Stitching Technique from the April '09 TJNL to add my Faux Stitching. I hadn't tried this technique when working on the Turbo Team assignments a few months back, but I have to tell you this has got to be the quickest and easiest way to add faux stitching to any project. No drywall tape on hand, dig out your Magic Mesh - if you're like me - you've probably still got some in your stash! The butterfly was created with the Butterfly Die, Black card stock, Teresa Collins Transparency and the horizontal slot punch. oooooooh! aaaaaaaah!! LOVE it!! Love the sketches too! LOL! Oh, Lisa...you book is stunning!! Love the transparency on it!! i love the bind it all too.